In the UK, the NHS are facing particular challenges from methicillin resistant Staphylococcus aureus (MRSA) and Clostridium difficile (C. difficile). The NHS has launched a range of initiatives including the HCAI Technology Innovation Programme, which aims to speed up the adoption of technologies to combat infections. As part of the programme since 2004 it set up the Rapid Review Panel (RRP) to provide independent advice on technologies that may be of value to the NHS in reducing infection. The study showed that CDIFF, MRSA and VRE can be found on hospital privacy curtains. More worrying, researchers found that these bugs transfer onto the hands of people who handle the contaminated curtains, suggesting that health care workers who operate these may be spreading bugs. The study found that 43 percent of privacy curtains were contaminated with VRE, 22 percent of them harboured MRSA and four percent tested positive for CDIFF. The findings, published in the Journal of Infection Control and Hospital Epidemiology, have put contamination and privacy control in the spotlight. At the same time the healthcare industry is in the midst of substantial refurbishment projects which demand innovative design and products as hospitals continue to modernize. Which hospitals use Privacy Glass by Smartglass? The benefits of using Privacy SmartGlass to reduce the spread of infection have seen a growing number of NHS practices incorporate Privacy SmartGlass into their wards. These include St Mary’s Hospital, the Royal Sunderland Hospital, and the Windsor Knee Clinic. St Mary’s Hospital in London, Paddington, is a general acute hospital that diagnoses and treats a range of adult and pediatric conditions. The hospital prides itself on delivering the best patient experience by continuously improving patient standards and facilities infrastructure. Facilities Director, Keith Murray, was keen to introduce innovative interior solutions which would help eliminate the threat of in-house infection and provide a comfortable environment where patient privacy and dignity would be protected at all times. The project involved using a series of glazed partition screens to section off clinical treatment rooms from public areas so that the spread of infection could be significantly reduced. SmartGlass Medical also installed 18 Privacy SmartGlass panels used for nine separate consultancy rooms in the Windsor Knee Clinic, Berkshire. These panels proved a good fit with the clinic’s specification of a sleek, modern and clean finish. 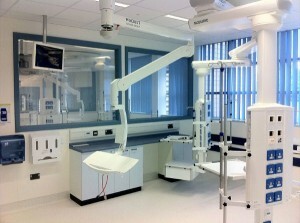 Each consultancy room is positioned along a corridor within the clinic with lots of people traffic passing by. SmartGlass provided the best solution to make each room instantly private and eliminated the need for curtains. 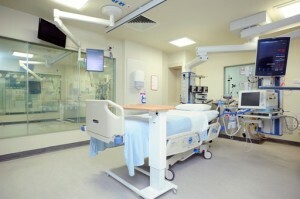 Privacy SmartGlass has helped hospitals and healthcare facilities reduce the spread of infection through the provision of easily cleaned surfaces. In addition, staff and patients alike do not need to handle the glass as they would for curtains. Consequently, this reduces the contact between people and materials. Cleaning SmartGlass can be done far more cheaply, supporting regular cleaning regimes with much less time and effort compared with traditional partitioning. Traditional privacy curtains are difficult to clean and take considerable time taking them down, washing them and putting them back up. Privacy SmartGlass can be used as wall panels, internal doors and windows, x-ray screens, room dividers or mobile isolation screens. It offers the patient dignity and privacy, allowing hospital staff to safely and efficiently review patient wellbeing, while crucially providing several key facets for reducing hospital acquired infections. SmartGlass partitioning also fits well with NHS directives to improve patient privacy and dignity by allowing patients to be in command of their surroundings. It provides for better soundproofing than curtains, giving patients enhanced control in resting and sleeping at their own behest. The material also lets in lots of light, which can help provide for a more holistic recovery process.